Like so many of you, we're spending the holidays with family and friends. Regardless, we've got a few posts scheduled for you the rest of today and tomorrow; the normal daily grind resumes on Tuesday. You'll be hard-pressed to find two better links to peruse and read in your downtime today, however, then the ones we're about to show you. The most fun thing about the annual "Happy Holidays" post is finding a suitable lead image for it. 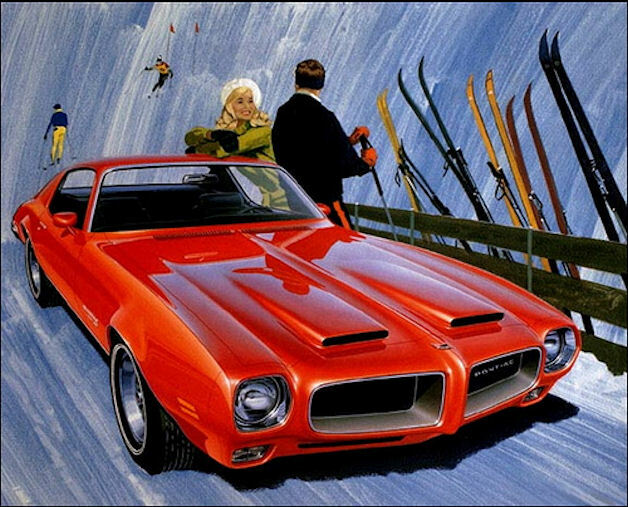 Many readers will doubtless recognize the wintry scene above, depicting a 1970 Pontiac Firebird Formula 400, as the work of Art Fitzpatrick and Van Kaufman. The two (Mr. Kaufman painted the scenery and people, Mr. Fitzpatrick the cars) are best known for their Pontiac works – so excellent that for years, per John Delorean's orders, they were the only images authorized for use in Pontiac advertising (no photos allowed) – but their decades-long collaboration also produced images for other brands as well. Fitz and Van started collaborating in the 1950s on Mercury, then moved to General Motors to work on Buick, which led to the iconic Pontiac run, as well as similar works for Opel during Bob Lutz's tenure there in the 1970s. We remember reading somewhere that Lutz has one of the Fitz and Van originals for Opel hanging in his home. Your mission today, between good times and great meals with friends and family, is to check out the page on Fitz & Van at PontiacsOnline.com, where you can scroll through most of the 285 works the pair created for the late, lamented performance division. From there, head to Art Fitzpatrick's homepage, for an excellent bio and more work examples, some that you'll recognize from recent years. We promise you'll be engrossed. All of us at Autoblog wish you a happy and healthy holiday, whether you're celebrating a very Merry Christmas, a Happy Hanukkah, a Festivus (for the rest of us), or just sitting at home and enjoying some well-deserved down time. Have a wonderful holiday – and as always, please drive safely while you make the rounds today. go to the link above to see a ton of great old Pontiac ad artwork, def worth a look.